The Milwaukee Bucks opened a three-game road trip with a loss and Giannis Antetokounmpo encountered a bat for the first time. 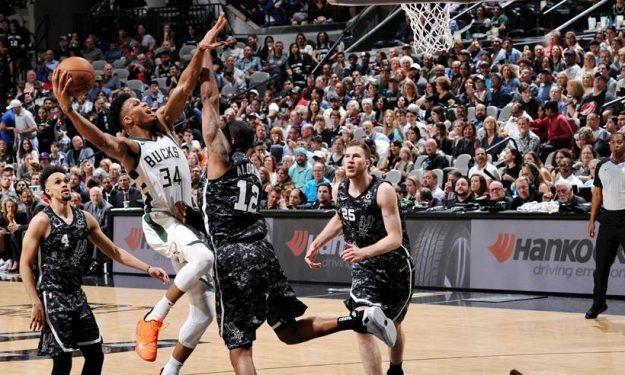 Giannis Antetokounmpo put up 27 points with 10/18 from the field, also had thirteen rebounds, six assists and one block on Sunday, but wasn’t enough for the Milwaukee Bucks against the San Antonio Spurs at the AT&T Center. The NBA leaders started a three-game road trip finishing a set of back-to-back games. They arrived late at San Antonio, but the Greek Freak didn’t want to use the travel following Saturday’s home match versus the Charlotte Hornets as an excuse. “The effort was there” he said. After his 48th double-double of the 2018-19 season, the 24-year-old forward pointed out: “San Antonio is a good team. They played really good team defense, packing the paint. I was trying to create some shots for myself but I was trying to find my open teammates. I think I did a pretty decent job but we weren’t able to knock down shots”. It’s worth noting that the game was delayed nearly a minute when a bat flew above the court because it was a new experience and a terrifying one for Antetokounmpo. “This is the first time I’ve seen a bat up close. I tried to run away from it. I can’t even deal with roaches and ants. There’s no way with a bat. I don’t understand why the mascot is a coyote; it should be a bat” he mentioned following the NBA 2018-19 Regular Season contest.